[WORD] Are you tired of creating documents that are chock full of text and hard to read? Maybe you’ve added graphics or charts to make them more eye-catching, but you still want to freshen up the look. You can communicate more stylishly by taking text that goes across the full page, separating it into columns and putting a vertical bar between them. NOTE: You don’t draw the line, you let the column feature do it for you. Columns can break up a page of heavy text — and the “line between” option helps the reader to view the page more easily by defining the separation. And it’s just plain sleek! It looks crisp and sophisticated. 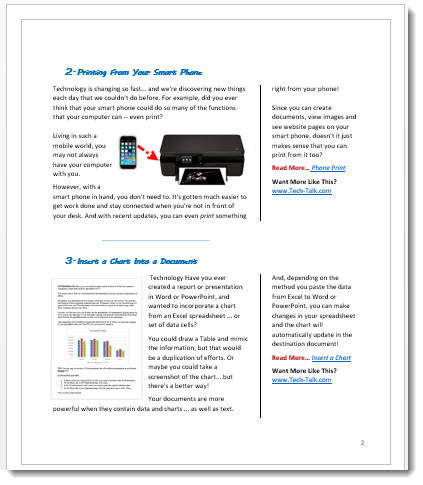 You can do it with so many different documents … not just newsletters and reports. However, there’s a trick to adding this divider line. If you just choose the Column feature and select the number you want, you miss out on other choices … the line! You need to know where this option is hiding. When you have content on a page that you want to format into columns, it’s easy to just highlight the text, go to the Page Layout tab and choose Columns… but there’s one more little piece that you need to add a divider line. The Trick: Instead of picking the layout you want, choose “More Columns” … then surprise — you get the same choices plus an option to add the line. Highlight the text you want turned into columns. TIP: It’s easier to do the formatting after all of your content is on the page. 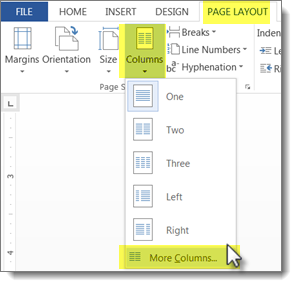 On the Page Layout tab, in the Page Setup section, select Columns. Click on the More Columns choice at the bottom. Choose how may columns that you want. Then check the Line between box to add a vertical line between columns. 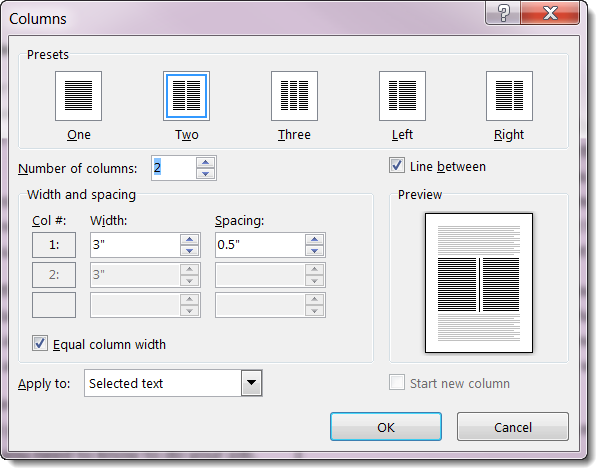 Adjust the spacing between your columns if you would like something other than the default. And make sure the Apply to option is set to Selected text so that only your highlighted text will be changed to columns, not the whole document. Try being creative, mix up types of columns, the 2/3 left; 1/3 right is quite refreshing. CAUTION: Always, always, always put your text in columns AFTER you’ve written the document. Never start with them because the coding gets really screwy and you’ll spend an enormous amount of time trying to fix it. So, be patient. Wait until the end. Then put all, or sections, into columns.